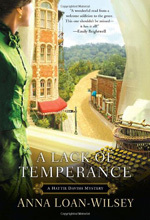 Hattie Davish has just arrived into the resort town of Eureka Springs in Arkansas to serve as the new secretary for Mother Trevelyan, president of the AWTC (American Womens Temperance Coalition). Unfortunately, the only time she gets to see her new employer occurs in the dramatic first pages of the book. Here anti-alcohol proponents are demonstrating outside the locale saloon while Mother Trevelyan, waving a broom, is inside smashing bottles and windows and, finally, setting the place on fire. In the days following, Hattie tries to find her charismatic employer only to discover Mother Trevelyan murdered in the basement of her hotel. Inexplicably, Hattie then tries to solve the murder of this woman she has never met, even when in the process she is threatened with a whipping and suffers from a push down some stairs. The books strength lies in its description of the temperance movement at the end of the 19th century. Snatches of temperance songs appear which note the affect on families when the consumption of drink "brings poverty and sighs unto homes most divine." Splits between those who support the movements acts of violence with those who advocate reform through measures such as anti-alcohol state propositions or education in the schools and churches, are worked into the plot. The mostly public derision against temperance ladies is nonetheless an obstacle they all had to endure. The description of 19th century popular warm water resorts such as Eureka Springs, which offered the healing powers of mineral waters, is nicely told. Some author historic notes about the temperance movement would, however have been useful. This is one in the Hattie Davish series set in diverse places.